comScore, Inc. released an overview of mobile commerce usage across the five leading European markets (France, Germany, Italy, Spain and the United Kingdom) using the comScore MobiLens service. The study showed that the EU5 mobile retail audience nearly doubled over the past year, with 1 in 6 smartphone users accessing online retail sites and apps on their device. In addition, 1 in 8 EU5 smartphone users actually completed a retail transaction on their phones. 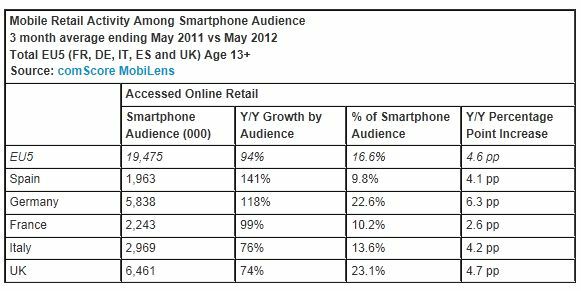 In May 2012, 16.6 percent of the EU5 smartphone audience accessed online retail sites and apps, displaying an increase of 4.6 percentage points in the past year. Spain was the fastest growing market with a growth rate of 141 percent to nearly 2 million smartphone users accessing retail brands like Amazon and eBay on their handsets. The UK was the largest market by absolute numbers with 6.5 million smartphone retail users, but also had the least rapid growth rate at 74 percent. Germany ranked a close second with 5.8 million retail users, and also had a relatively high penetration of mobile retail users at 22.6 percent. Approximately 1 in 8 EU5 smartphone users (12.4 percent) purchased goods or services on their device in May 2012. Among the 19.5 million smartphone users who accessed retail content, 75 percent conducted a transaction. An analysis of the top 5 types of goods and services purchased via smartphones showed clothing or accessories (4.3 percent of smartphone audience) and books (3.2 percent) to be the most popular retail categories. Other services or goods purchased by European smartphone owners were consumer electronics/household appliances (3.1 percent), tickets (3.1 percent) and personal care/hygiene products (2.1 percent). “Given Europeans’ existing predilection for online apparel shopping, it is not surprising to see this category rank as the most popular for purchase via mobile devices. But it’s also possible the category’s popularity corresponds with the heavy use of email marketing, with consumers more likely to see and respond to offers on their phones when they check their email,” added Mr. Al-Jehani. 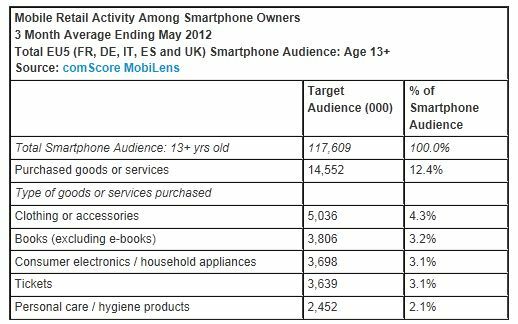 The table below shows comScore’s May 2012 mobile benchmark data, including a review of mobile consumption behaviour and device penetration for the five European countries under measurement. These benchmarks are published by comScore to provide the most up-to-date snapshot of the mobile industry. Further information on these benchmarks, and other data included above, can be provided upon request.